1 Place the sweet potato and butternut squash in a large saucepan of water and bring to the boil. Then turn down to a medium to high heat for 8-12 minutes. 2 Pre heat the wok or large pan on a medium heat and add the oil. Then add the red onion, yellow pepper and green pepper and stir. After about 2 minutes add the paprika, smoked paprika, turmeric and tomato puree and stir. 3 After 5 minutes then add the garlic and tomatoes then stir. 4 Then add the green lentils, fresh thyme, black pepper and a small dash of tamari (gluten free soy sauce) then stir. Add the water and the corn flour water then stir. Place the on and allow to simmer for 5-10 minutes stirring occasionally, if it starts to stick add a little more water. 5 Meanwhile drain the sweet potato and butternut squash in a colander and add it back to the saucepan and mash with a potato mash. Then add the saucepan back to a medium heat and mix the potato and butternut squash in order to dry any excess water. When done set it aside. 6 Stir the lentils and remove from the heat and pour into an oven proof dish then set aside and allow to cool for 10 minutes. 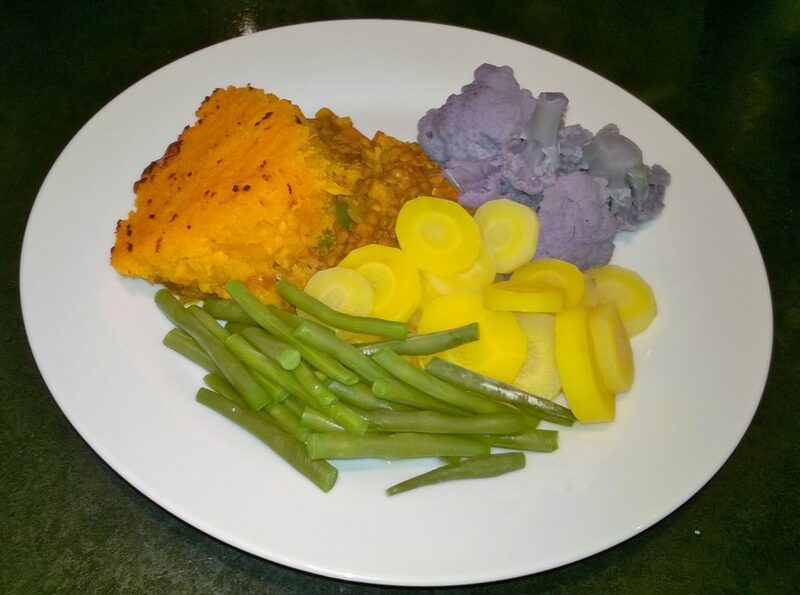 7 Then place the green beans, purple cauliflower and yellow carrots into separate saucepans with warm water and add a pinch of salt to them all. With the lids on bring them to a boil on a high heat, and then turn it down to a medium to high heat. Cook until you could just get you fork into it. 8 Place the sweet potato and butternut squash on top of the lentils mixture and spread evenly. Then place under a grill on a high heat to get some colour. Once it has a bit of colour, remove from the grill and let it stand for 5-10 minutes. 9 Then serve up and enjoy!